There is no other worrying thing you will ever encounter as a chef in your cooking endeavors than realizing you used your ingredients interchangeably. Such a scenario occurs when dealing with baking soda and baking powder. 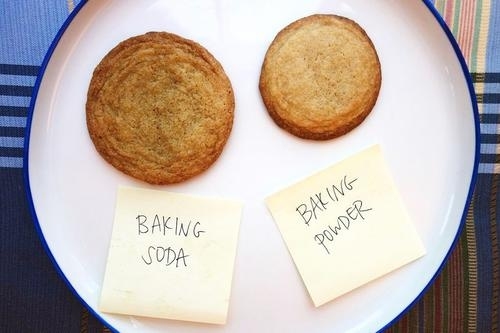 These two ingredients look alike but if you substitute baking powder for baking soda, your baking will become wonky. Regarding baking soda and baking powder, you need to understand that baking powder is made from baking soda. To make some baking powder, all to do is add a proportion of dry acid to a specific amount of baking soda. Meaning, you can substitute baking soda for baking powder although you need to follow the procedure explained below. Bearing in mind these two vital kitchen ingredients contain one similar property, below is an explanation of how to substitute one for the other. Before getting into the details on how to substitute baking powder for baking soda, you need to understand one thing. Baking soda plus other ingredients like acids get mixed to make baking powder. Baking powder is made from baking soda, meaning that baking soda is the most concentrated form. For that reason, you need to double or triple the quantity of baking powder to that of baking soda you require. If you needed one tablespoon of baking soda, you must use two to three tablespoons of baking powder. Note: the extra ingredient added to baking soda to make baking powder does affect how your food tastes, but not to alarming levels. The same way it is possible to substitute baking powder for baking soda, you can use baking soda in place of baking powder. But, you will need to add some ingredient to the baking soda potion to give it that baking powder taste, property and effect while you bake. You can call it making a homemade baking powder. The trick or idea of making homemade baking powder lies in the proportion. If you needed one tablespoon of baking powder, you would need to mix two tablespoons of cream of tartar (dry acid) and one tablespoon of baking soda. Note: no matter the amount you needed for baking powder, the ratio of two to one (cream tartar to baking soda) should remain. If you need three tablespoons of baking powder, then you need a mixture of six tablespoons of cream tartar and three tablespoons of baking soda. Below are other informative facts you need to know regarding baking soda and baking powder. These two ingredient chemical composition are used to differentiate between them. If you have a question like "can I substitute baking powder for baking soda?" the answer is yes. It is even correct to say baking powder is one ingredient used to make baking powder. Baking soda contains sodium bicarbonate (a base) which can react with acids in vinegar, yogurt, and buttermilk to produce carbon dioxide. When baking soda is used to bake, a reaction between sodium bicarbonate and cream acid happens which creates carbon dioxide in the form of bubbles. That reaction is called chemical leavening. When those gas bubbles get trapped in the dough, they cause the dough to rise. But one disadvantage of baking soda is, its reaction never lasts long enough to sustain dough rising all the way to full baking. It's a one-time reaction and a short-lived one. Baking powder is used because it incorporates sodium bicarbonate from baking soda and two other acids to sustain the dough rising to a full baking point. Those two acids are monocalcium phosphate and sodium acid pyrophosphate which can get substituted with sodium aluminum sulfate. Monocalcium phosphate reacts with sodium bicarbonate after getting wet. The two never react when dry. But once wet, their reaction begins which produces a CO2 bubble to cause some chemical leavening. But to sustain the leavening when the dough is being heated in an oven, sodium aluminum sulfate and sodium acid pyrophosphate are much needed. These two acids maintain the CO2 and bubbles production until the cooking is complete. It is through this reaction that you get well-formed cake, bread or muffin. These two baking ingredients have different shelf lives. When baking soda is stored in a cool, dry place and well-sealed, it can last for quite a long time; more than a year and even longer. For baking powder, you have to be very careful. Once opened, you can only use it for a few months before you it becomes unfit for human consumption. Additionally, if baking powder is stored in humid environments, it will last for an even shorter period. Although it is possible to confuse baking powder to baking soda, the two have different shelf lives and expiry dates. If you want to check whether baking soda is still good, scoop some of it into a bowl. Add some vinegar, and if a leavening is formed, then it is still suitable for human use. To test if baking powder is still good, put some of it in a bowl and add a little water. If it manages to foam up, then it is still good for human use. Both baking soda and baking powder can get used interchangeably, but you need to know how. The above illustrations and proportions to use are essential. All you need to do is understand what to add to what amounts and when. With the details above, you will never get frustrated when you realize your pantry has only one of the baking ingredients and not the one you needed.